New Winter 2018: This cute chameleon will delight reptile enthusiasts, kids and anyone who enjoys unique ornaments for the tree. The chameleon charm glass personalized Christmas ornament stars a green and blue lizard perched on a stump and looking rather mischievous. These are animal ornaments personalized for the recipient, so we’ll use a stylish font to add the information you provide. The result is a special keepsake that is one of a kind. 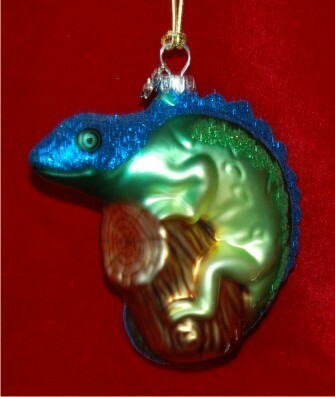 One of many glass animal ornaments in our collection that makes it easy to create a theme for your display, the blue and green chameleon Christmas ornament arrives in our exclusive velvet gift bag.